Tests of Elphidium crispum, photographed by Spike Walker. 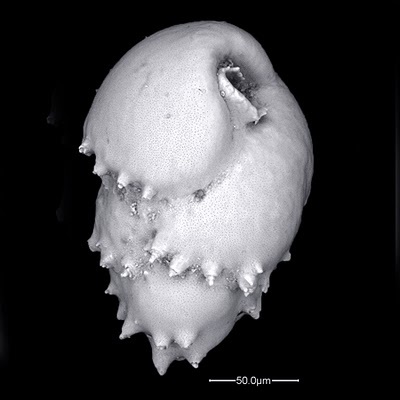 The foraminifers have been featured on this site a number of times before, when various members of this diverse group of unicellular organisms have been introduced. Today, I thought I'd take a look at the broader classification of forams through the lens of one of their major subgroups, the rotaliidans. The earliest classifications of forams divided them on the basis of the number and arrangement of chambers within the test, but over time the composition of the test walls came to be also recognised as an important feature (Haynes 1990). This reached an apotheosis of sorts in the Treatise on Invertebrate Paleontology classification of Loeblich and Tappan (1964), in which the forams were divided between five suborders primarily on the basis of test composition. These were the Allogromiina (with membranous or chitinous tests), Textulariina (with agglutinated tests) and three suborders with calcareous tests but differing wall structures: the microgranular Fusulinina, the porcelaneous, imperforate Miliolina and the hyaline, perforate Rotaliina (other authors would treat these groups as orders, with the suffix -ida instead of -ina). However, later authors (including Loeblich and Tappan themselves) regarded this classification as somewhat oversimplified, and divided groups such as the planktonic rather than benthic Globigerinida, the aragonitic rather than calcitic Robertinida, the Lagenida with monolamellar rather than bilamellar walls, and the high-spired or serial rather than planispiral Buliminida from the Rotaliida proper (Haynes 1990). However, many of the subdivisions within forams remained somewhat artificial, and potentially did not reflect true evolutionary relationships. Bulimina marginata, photographed by Fabrizio Frontalini. Molecular phylogenetics of forams got off to a fairly rocky start. 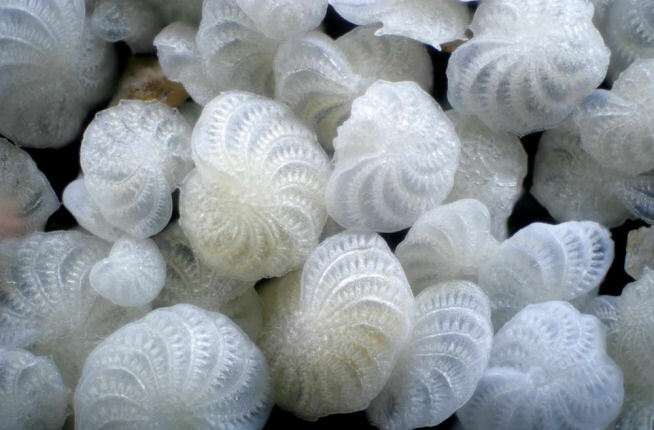 For various reasons, extraction of reliably genetic samples from forams is a difficult process (for instance, their tendency to live in symbiotic associations makes contamination a continuing issue). However, studies have progressed to the point where a broad outline is beginning to emerge. One significant agreement between studies has been the monophyly of forams with a perforate calcareous test (Flakowski et al. 2005; Schweizer et al. 2008). The 'Globigerinida' and 'Buliminida' have both been shown to fall within this clade, and should probably not be distinguished from the Rotaliida. No representatives of the Lagenida or Robertinida appear to have been analysed molecularly; the lagenidans may be an independent lineage, while the robertinidans may be closely related to the Rotaliida (Sen Gupta 2002). 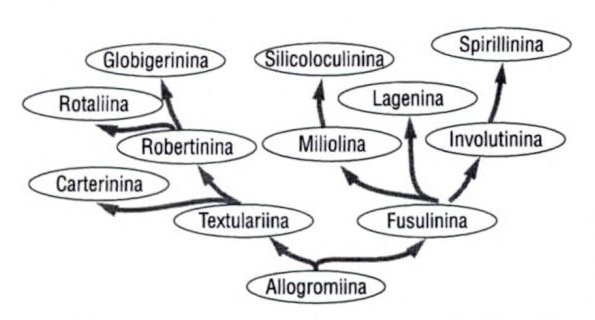 Suggested relationships of major foraminiferan groups from Sen Gupta (2002). This arrangement, which is somewhat concordant with available molecular data, proposes two separate lineages of multi-chambered forams, with calcareous members in each. 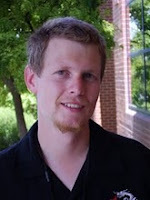 Within the Rotaliida, the most extensive molecular analysis has been that of Schweizer et al. (2008), whose results support a division between three main clades. Though reasonably well supported molecularly, these clades do not correspond to morphological divisions: the 'Buliminida', for instance, are divided between at least two clades. The planktonic forms may also be polyphyletic within the Rotaliida, though analyses have been inconsistent on their exact position in the clade (and Schweizer et al. do not include any globigerinidans in their analysis). Not all molecular results clash with the morphology, though: the Nummulitidae, a group of giant discus-shaped forams that get up to five centimetres in diameter, are one of a number of families that remain supported by either data source. 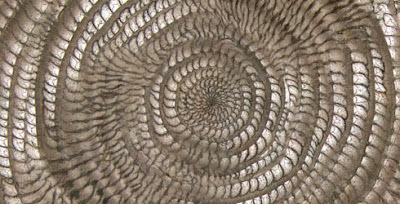 Internal chambers of Nummulites gizehensis, from the Natural History Museum. This species is most famous for being the major component of the limestone used in the construction of the pyramids of Giza. Flakowski, J., I. Bolivar, J. Fahrni & J. Pawlowski. 2005. 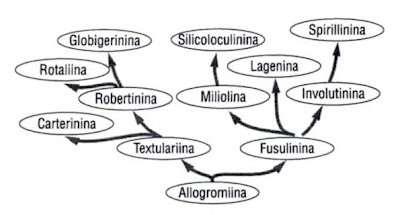 Actin phylogeny of Foraminifera. Journal of Foraminiferal Research 35 (2): 93-102. Haynes, J. R. 1990. The classification of the Foraminifera—a review of historical and philosophical perspectives. Palaeontology 33 (3): 503-528. Loeblich, A. R., Jr & H. Tappan. 1964. Treatise on Invertebrate Paleontology pt C. Protista 2. Sarcodina, chiefly "thecamoebians" and Foraminiferida, 2 vols. The Geological Society of America and The University of Kansas Press. Schweizer, M., J. Pawlowski, T. J. Kouwenhoven, J. Guiard & B. van der Zwaan. 2008. Molecular phylogeny of Rotaliida (Foraminifera) based on complete small subunit rDNA sequences. 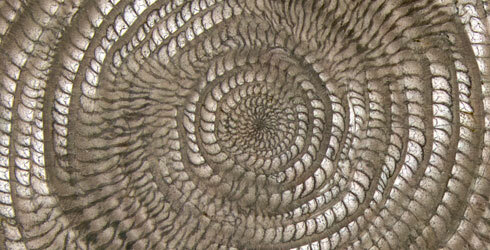 Marine Micropaleontology 66: 233-246. Sen Gupta, B. K. 2002. Modern Foraminifera. Springer. I'm writing to tell you how much I love your blog. I'd love to include a link to your blog and include some pictures in my own blog if that's ok with you. I am an artist currently working on a project with a waste water treatement plant in my area and am fascinated about all the science I snoozed through in school.....Making art about science has opened a door for me. Take care and I look forward to reading more posts on your beautiful blog. Link away, but for pictures link to the original sources, not to me. 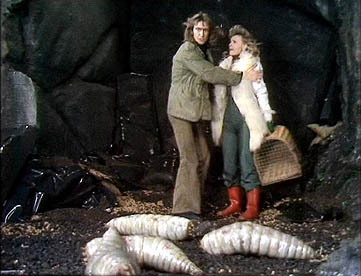 The Stoneflies: Old or New?